Council Member George Leventhal, who is running for County Executive, has released an internal poll from Celinda Lake’s firm showing a wide open race. The poll surveyed 400 likely voters with a margin of error of 4.9 points. 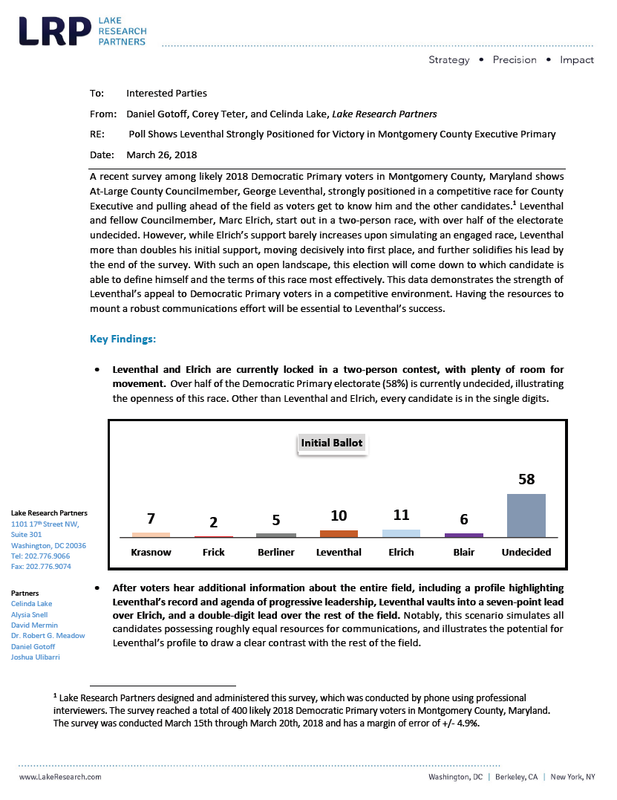 We reprint the three-page polling memo below and have a few comments following. So what can be gleaned from this? First, voters aren’t paying attention yet. No candidate draws more than 11% support in the first run of questions and undecided gets 58%. Second, the margin of error (4.9 points) matters. In the first run, that means there is no statistically significant difference between the six candidates. For example, Bill Frick polls at 2% but, with the margin of error, could be at 6.9%. Marc Elrich polls at 11% but, with the margin of error, could be at 6.1%. In effect, no one is leading. 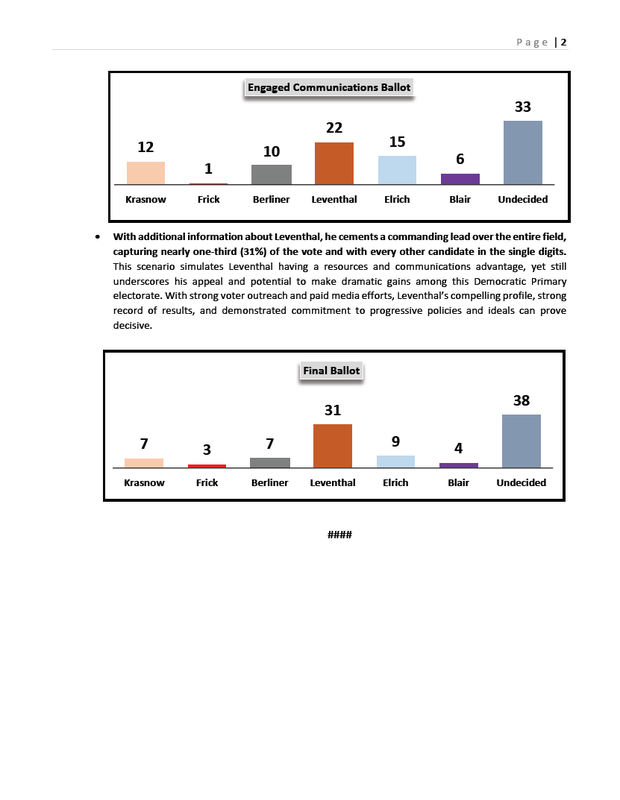 Third, even with the “engaged communications” part of the poll, Leventhal is still within the margin of error against Elrich. 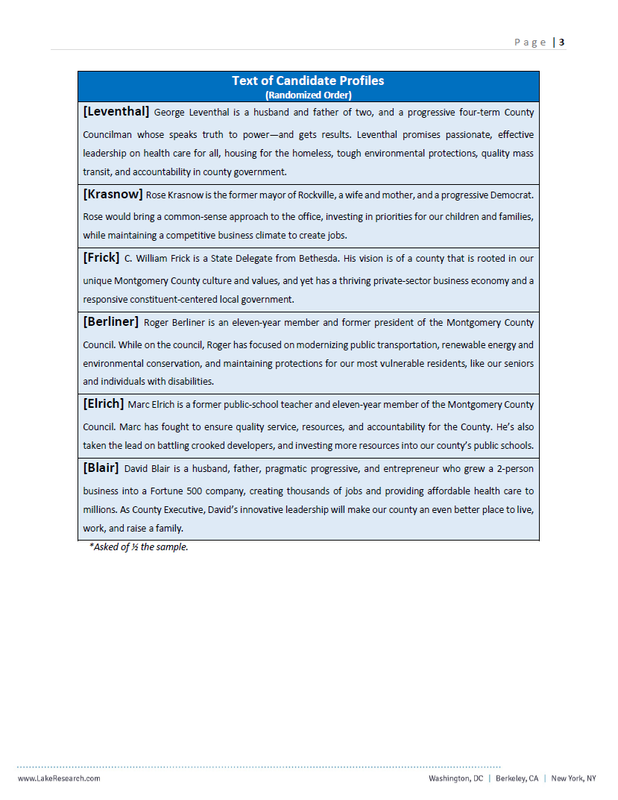 As for the “final ballot” that shows Leventhal blowing out the rest of the field, it appears to depend on giving respondents additional information on Leventhal and not on the other candidates. It “simulates Leventhal having a resources and communications advantage” that does not exist. At the moment, he will be fifth in cash on hand once the latest public matching funds are disbursed. Could Leventhal win? Sure, it’s possible. He is a four-term incumbent, a former chair of the county Democratic Party, has a geographically diverse base of small contributions and is working as hard as any candidate in the county. But the simulations showing Leventhal leading the field right now reek of spin. Voters aren’t fully engaged yet and no one other than David Blair has started mailing regularly and going on television. We believe the poll’s real message, which is that no one has wrapped up this election quite yet. Disclosure: the author is a publicly-listed supporter of Roger Berliner. Previous PostLacefield Responds on County Stormwater PlansNext PostUnelected Beyer Over Claims, Saying She “Passed” Legislation.